I've always had pretty neat handwriting (people I went to school with used to joke around and ask, "What font is that?") and I've always enjoyed creating stylized hand lettering. Up until recently I've just done it for personal projects like card making and gifts for friends, but after doing some hand lettering work on my friend Marion's menu board, another local business got in touch asking for my services. At first, the guys at Trippy Taco wanted me to create a template for their specials board that the employees could then write the daily specials on. After a few weeks, the bossman decided he loved the design of the board so much, he'd rather have me create some removable panels that could be swapped out on a daily basis instead of relying on his employees' artistic talents. Below are some photos of the specials board in the restaurant and the individual panels that I created for them. I must say I really enjoyed this project! I've been focusing on photography so hard lately that I've really neglected my graphic design and typography skills, so it was good to get back into it and have a fun project from a really great local business. One of my most memorable projects of 2012 was definintely my first book cover design and layout. Every so often I get the opportunity to try something entirely new, and it's always a whirlwind of emotions... mostly excitement, some confusion and frustration, and in the end a sense of pride. Nadine Riopel The Author has also been my client as a Public Speaker and as a Bride. I first met her when I was hired to take some headshots in 2011, then was asked to photograph her wedding and help design the cover for her first book, The Savvy Do Gooder: Giving That Makes a Difference. Nadine studied international development and business administration in university, has spent a lot of her free time volunteering for a multitude of causes, and spent several years working professionally for a charitable organization. Her "misadventures" (as she puts it) in the charity world led her to conclude that the best way to truly do good was to help the masses maximize the effect of their giving for their intended result. So Nadine wrote a book. She hired me to do the interior layout as well as concept and execution of the cover design. We threw around a lot of ideas, but ultimately Nadine wanted to stress the fact that "giving" doesn't always mean money; it can also mean giving of love, knowledge, skills, time, adivice... the list goes on. 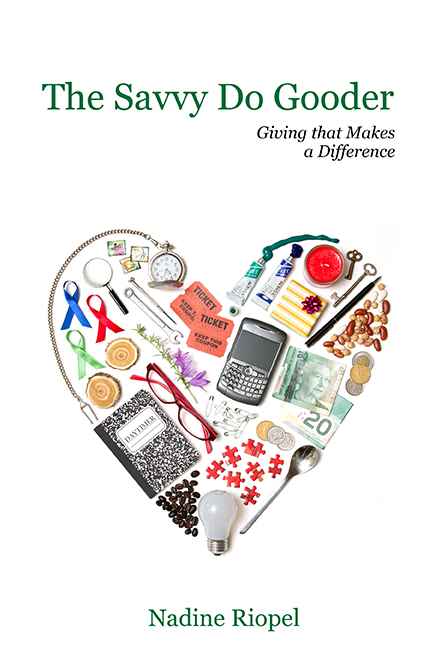 I had an idea for the cover design to create a heart shape out of smaller objects symbolizing these other ways of giving, then photograph the collage. Nadine really liked the idea. The rest of the cover design was centered around some of Nadine's preferences: her favourite typeface, her favourite colour, a clean simple approach with lots of whitespace. 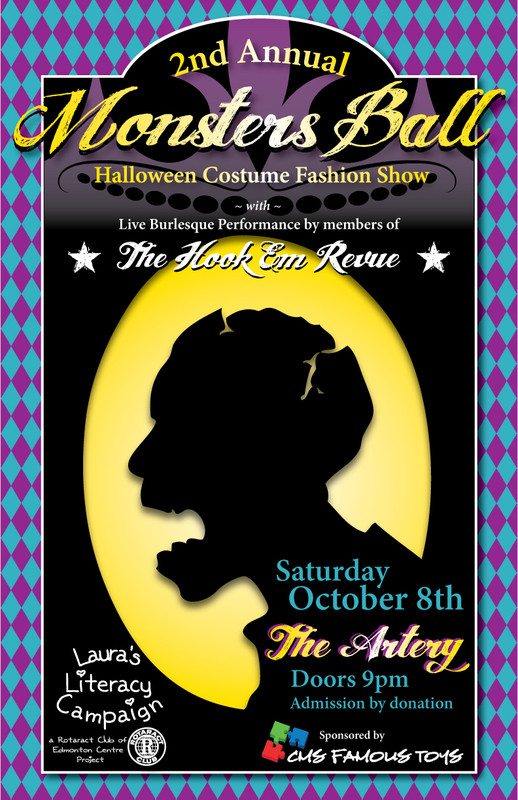 After working back and forth for most of the summer, The Savvy Do Gooder went to print on September 2nd, 2012. The e-Book process was complicated, but once that was all sorted Nadine decided to have her official book launch on December 2nd at Audrey's Books on Jasper Ave. Audrey's is very supportive of local writers, which is a blessing for a first-time author like Nadine. 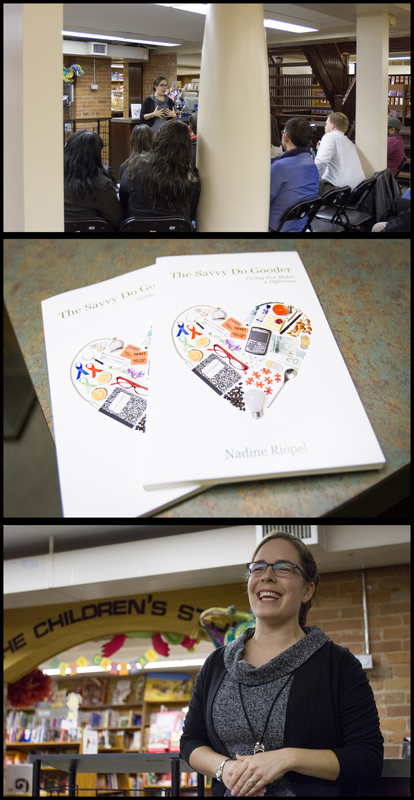 I went to the launch to support Nadine and take some photos. She spoke about the contents of her book, about how making a difference is often more complicated than donating your time or money. The part I most enjoyed was about finding the organization that is the right fit for the good you want to do in the world. Look at her smile. She has truly found her calling. I'm really proud to be a part of this project. If you're interested in learning more about giving smart while supporting a local author (and designer!) check out The Savvy Do Gooder Bookstore. My friend Monika is a pretty incredible woman. In addition to being the driving force behind Cash Mob Edmonton and a community champion for her fundraising efforts with events around the city like Monster's Ball and the Mod Bod Art & Film Show, she is also a small business owner, anatomy nerd and health advocate. It's no surprise that the business she has chosen to build is a mobile massage therapy and flexibility training venture. Monika and I frequently trade design or photography work for massage therapy, as was the case for the Monster's Ball poster, and this logo for her new company. I am proud to have created a logo for her that was exactly what she was looking for with the few suggestions she gave me. There is no one I could reccommend more for an invigorating and re-aligning deep tissue massage than Monika. Before each session she takes the time to assess posture, foot position, shoulder position and much more to tailor a custom massage to cure what ails you. This isn't just a back-rub, Monika has the ability to re-align parts of your body that you didn't know were misaligned. She was also an integral part of the healing process after I broke my leg in August of 2010. Get in touch with her, support a local business and see just how great you can feel! Send Monika an email at with.health@gmail.com to connect. Earlier this year I was approached by Arif Khan, the Alberta Liberal Party candidate in Edmonton Riverview. Once nominated, Arif wanted to attempt something different with respect to political campaigning, and he wanted to start by building a modern brand for himself, incorporating the recently rebranded Alberta Liberal Party visual identity. After creating a clean wordmark for him, Arif had me design a door-knocking postcard which started getting a lot of attention from other Liberal candidates in Edmonton. 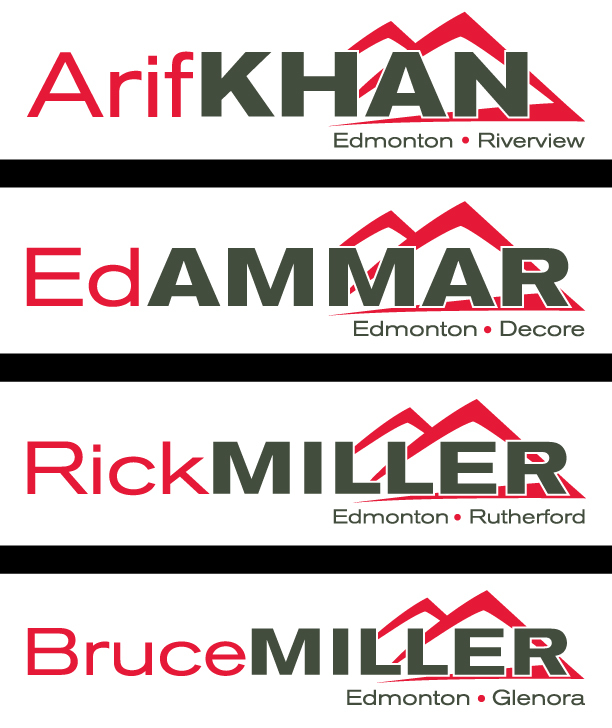 Before I knew it, I was branding and creating postcards, letterheads and business cards for 3 other candidates: Ed Ammar, Rick Miller and Bruce Miller. This has been such a great opportunity for me, and I'm excited to add the Alberta Liberal Party to my client list. Below is a sampling of the wordmarks I did for each of the candidates, and check out this update to my design portfolio to include more of this work.